The New Haven Register Blogs: Ramblings from The Runway: Merry Christmas! Just wanted to take a moment to wish all of you a happy and healthy holiday season, from my family to yours. The Runway will be back the day after Christmas, when yours truly, savvy traveler that I am, will be on the road by 4 a.m. in an attempt to catch a 6:20 flight out of JFK to Charlotte. But there should be a lot to update during the five days in North Carolina. To tide you over, a few thoughts, links and pictures. I Netflixed "Pumping Iron", the 1977 body building documentary that introduced us to Arnold Schwarzenegger, the charismatic, cocky and hysterical 5-time Mr. Olympia, and Lou Ferrigno, the young up-and-comer hoping to dethrone the champ in his final competition. 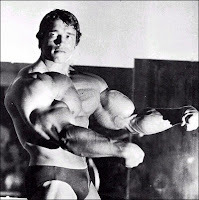 It is a fascinating look at the world of body building through a cast of unique characters in the 70s and shows the lengths a then-unknown Schwarzenegger went to psyche out his opponents. Great movie. But when I tried to talk about it to others, very few had seen it. It got me thinking. Now, everyone knows all about Hoosiers and Rocky, perhaps the two best sports flicks of all-time. But what about the top five most underrated sports movies? You know, the ones not that many folks have seen or haven't seen in ages because they're hardly ever on TV. Because I am only out for your best interests, here's my list of the five must-see sports movies you may not have seen or forgotten about. 1. "The Bad News Bears" (1976). One of my favorite movies of all-time, if only because it reminds me of my days playing Little League baseball. So many parallels...the coach (in my case, coaches) who show up to every practice and game with a cooler full of cheap beer, the tough-guy 12-year old who rides around on a Harley and is the best player in the league, the rival coach who takes everything a little too seriously and who everyone hates...I could go on and on. My league was missing the ace girl pitcher with the wicked deuce, however. This movie also has the greatest final line in movie history, recited by the incomparable Tanner Boyle. "Hey Yankees! You can take your apology, and your cruddy trophy, and shove 'em straight up your a**!" 2. "Pumping Iron" (1977). It's simply a must-see. Ah-nold delivers the best scenes, with both intentionally and unintentionally hysterical lines. But the best scenes may involve Lou Ferrigno's overbearing father trying to give him posing tips ("it's like you're saying to the judges 'get a load of this hunk of man.' OK? Now you try it,") or Arnold playing mind games at breakfast with the Ferrignos on the morning of the Mr. Olympia contest. "I already called my mother in Austria and told her I won," Arnold tells Lou. "She is so happy. Can you believe it? She is already telling her friends I am a six-time Mr. Olympia." "Of course, Arnold goes on to win the title over a completely psyched out Ferrigno. 3. "Victory" (1981). Set in World War II at a POW camp, a group of allied prisoners plays a soccer game against the German national team in Nazi-occupied Paris. While I could never buy the scene where the prisoners, who are set to escape through a tunnel in the locker room at halftime, decide they'd rather stay and finish the game, it's still a tremendous film, even if it is about soccer. Features Pele (who delivers one of his trademark bicycle kicks), Max Von Sydow (the Nazi who can't help but applaud Pele's heroics) and goaltender Sly Stallone (who hikes his shorts up to his chest). 4. "Mr. Baseball" (1992). Tom Selleck as an aging, primma donna baseball player who is forced to go to Japan to continue his career. I always liked Selleck as an actor (did it get any better than Magnum P.I.?) and he's believable as an athlete (since he did play college hoops at USC). It's the classic fish-out-of-water plot about the selfish jerk who needs to learn the concept of team ball (and how to hit the mythical Japanese pitch, the "shuto", which, much like Dice-K, doesn't live up to the hype). But it works well. Also stars the guy who played Pedro Cerrano in Major League. 5. "Breaking Away" (1979). When flipping through channels, I always stop to watch this "young buddies coming-of-age" film about teenagers from Bloomington, Ind. coming to grips with life after high school. If you can get past shirtless Dennis Quaid's ridiculous nut hugger cutoff shorts, you'll enjoy it. Also stars the great Jackie Earle Haley, a.k.a Kelly Leak from the Bad News Bears, and Daniel Stern ("Hi. What's your major? Soc? That's a good major."). The main character, the ultra-goofy looking Dave Stoller, is an aspiring cyclist who races 18-wheelers and pretends to be Italian. The movie is shot in and around Indiana University, and culminates with the "Little 500" bicycle race, one of the school's most well-known annual traditions. And I'd be remiss without listing my five favorite Christmas movies/specials. 1) A Charlie Brown Christmas. 2) A Christmas Story..."you'll shoot your eye out, kid". 3) Home Alone. 4) Rudolph the Red Nosed Reindeer. 5) National Lampoon's Christmas Vacation. Couple more quickies before I leave you to wrap Christmas presents. Donald Thomas will be writing daily post cards from Charlotte for the print edition of the New Haven Register, while Rob Lunn and Tony Ciaravino will both be blogging for uconnbowl.com. Both should be interesting every day. For those who enjoyed the link posted a few days ago to Carl from the "Aqua Teen Hunger Force", here's another one that will make you laugh out loud. 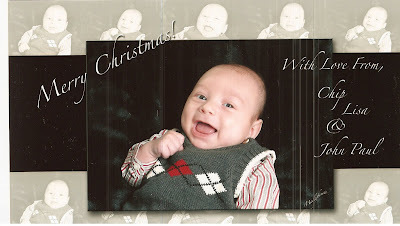 He'd like to wish you all "a very Merry Christmas. Dummy." and also provides his bowl picks..."98-year old Bobby Bowden still has some tricks left in his colostomy bag." Watch it. Here it is. 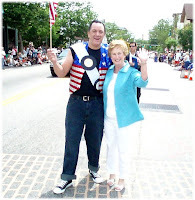 And before we go, Wayne "Fabian" Norman was nice enough to provide the photo of himself from the Willimantic Boom Box parade that doubles as the Mr. July spread in the WILI-1400 wall calendar for 2008. I for one will be whistling my faves from the "Grease" soundtrack next summer. Oh yeah. That's Gov. Rell posing with our Wayne-O. Almost makes me want to forgive him for being a Red Sox fan. Almost. I own SportsInMovies.com so I can provide a few underated sports films I've seen that many have not.